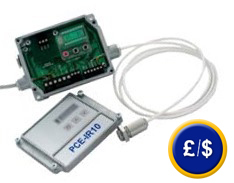 The PCE-IR10 temperature tester is made up of a small sensor head and a separate electrical component. The temperature tester sensor is so small that it can fit in almost any space. Apart from this, the device offers similar functions to other devices. The electrical component of the PCE-IR10 facilitates the use of functions that are not normally found in a device of this quality. Among these are adjustable emissivity, minimum, maximum and average value, as well as software to programme the device via a computer or directly from the unit's LCD. Due to its small size, this temperature tester is ideal for various systems in a production line. The device is accurate, easy to install and economical. Measuring temperature with the PCE-IR10 non-contact temperature tester is an economical alternative to similar contact devices (additoinal information about the functioning principle of measuring temperature with thermometers). Also, read this brief text about the practice of measuring temperature with infrared devices. To get the highest precision from this device, the user can adjust the emissivity, which is different for each type of surface material being measured. 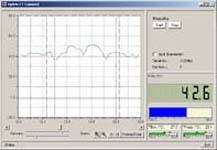 (See a table of emissivity values) If the user measures a material which is not in the table, they can establish the emissivity value and adjust the temperature measured for the temperature reader. Here you will find the method for determining emissivity. Here you will find a list of contact temperature testers. 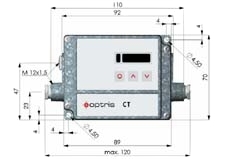 CT Connect software allows the user access to other digital functions for the device and its RS-232 and RS-485 interfaces. It is compatible with Windows 95 / 98 / NT and 2000, making it possible to set parameters, to use a sensor remote control as well as to automatically save readings for analysis of production quality. The optical resolution of this temperature tester is 15:1, making it possible to measure temperatures in ranges of LT, G5 and MTB. With this device, the user is equiped to measure almost all surface materials and can process readings by way of analogue and digital methods. 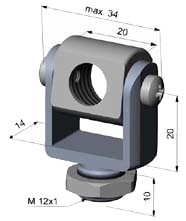 The small sensor head can be positioned in difficult to access places. It has an optical resolution of 15:1. 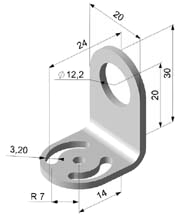 Its dimensions are 28 x 14mm and the cable has a diameter if 5mm and is 1m long. 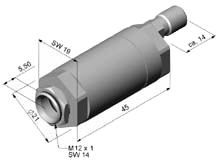 The non-contact temperature sensor is used mainly in places of work where different temperature zones are found. 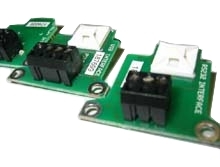 Up to 32 sensors can be controlled with an RS-484 connection.